How should I cook this fish? Our fresh fish fillets are easy to prepare. We know they sound like a complicated bunch with names like White Grunt, Blueline Tilefish, and Red Drum… but don’t be fooled, they’re a breeze to cook. The basic prep method for any fresh fish fillet is the pan saute. Use a fat or oil – olive oil, butter, coconut oil, ghee – they all work well. Cooking times vary based on the density of the fillets, but 2-3 minutes per side is a good general rule. Keep the seasoning light and simple with a little salt, pepper, and a pinch of fresh garden herbs. Check to see if the fish is done just as you would with chicken – cut into the meat and look for bright red, pink, or clear depending on the species. We cannot recommend enough Mark Bittman’s article in the NY Times: White Fillet A Dozen Ways. He covers several cooking techniques for flakey white fish, with suggestions on how to serve each. 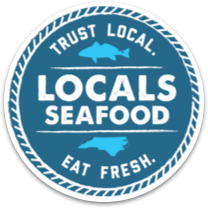 We love to see what you cook – share photos of your meal with us Instagram, Facebook, or Twitter @localsseafood or email them to info@localsseafood.com.